There are times when standing on a chair or hanging out a window aren’t quite enough to get to those difficult-to-reach places. Whether you’re having some building work done or the exterior of your home’s being painted, scaffolding it often required. Though some decorators and roofers provide their own access towers, these small frames don’t offer the flexibility many contractors need. This means it’s a good idea to head to a site like Quotatis and investigate scaffold hire prices. Scaffolding is a flexible system of steel poles and walking boards that allow tradesmen to work safely, at height, around a building. It’s often used outside, but can also be useful for interiors; when trying to access vaulted ceilings, for example. Scaffolders normally provide ladders and handrails as standard, and have specialised equipment to work in difficult spaces, such as a narrow alleyway or bridging over a conservatory. Several levels can be incorporated into a scaffold system, though each lift and level will increase the price. As you might imagine, there are many factors affecting scaffolding prices. Regional variations can have a big effect on the final price, whilst height, flexibility and access considerations will also be reflected in the quote. The standard hiring period in the scaffolding industry is between six and eight weeks, and you should be provided with a fixed sum for this length of time. If work’s expected to take longer, you’ll probably have to pay an additional weekly rental rate thereafter. Unsurprisingly, the higher you need your scaffolding to go, the more money it will cost. Other factors also attribute to height costs, including having to scale a narrow alleyway or place footings on public land. Location can have a huge effect on the price, with London being almost three times more expensive than a remote location in Scotland. The more walking levels you require, the more expensive scaffolding will become. If you’re just working on a chimney or roof, you’ll probably only need one lift and walking level. However, if you’re having your house painted, two or more walkways will probably be needed. In some cases, scaffolding will have to be erected on a public road or footpath. In such instances you’ll have to get a licence from your local council, and this can be expensive. The easiest way to build scaffolding is to go straight up from a flat footing located on private land. However, there are times when special requirements are needed. These include having to bridge a gap over a driveway, conservatory or pathway. It’s not hard to do when you’ve got specialist equipment, but it will cost more. Another important aspect of scaffolding hire costs is how accessible a building site is. The cheapest quotes will be for situations where scaffolders can snap together the frame quickly and simply. However, if there’s no access to a side passage, for example, and everything has to be carried through the house, the entire project will cost more. Please fill in the short form below to get quotes from scaffolding companies in your local area. Feel free to keep reading to learn out more information about scaffolding prices. When you’re paying large sums of money for work, it’s essential to gather a minimum of three quotes before deciding on a contractor. The following examples suggest average prices for several scenarios to help you establish whether a quote’s reasonable. In general, scaffolders prefer large jobs, and you shouldn’t expect a small project to come in extremely cheap. If you need to repair a leaky gutter or replace a couple of roof tiles, you might only need a single, vertical tower. Outside of London, you can expect this to cost between £250 and £300, with prices in the capital averaging £300 to £400. There are times when you’ll need some special equipment to access areas with poor access. For example, you may need to erect a bridge over the top of a conservatory to reach the exterior of your home. Because of the equipment and extra time required, costs vary between £400 and £550, with costs in London increasing to between £650 and £700. Cracked and unstable chimney stack’s often require repair work, and though you don’t need to wrap your entire house, you’ll need to access the chimney and secure it. This means scaling the height of your home and then wrapping all four sides of the stack. In London, expect to pay up to £900 and a minimum of £750. Costs are a little cheaper elsewhere, and should be between £550 and £750. 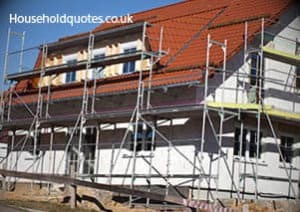 An elaborate scaffold structure is often needed when you’re having roofing work done, and you’ll need three sides of your property wrapped in scaffolding. Erecting the steelwork to gutter height and providing a lift and one walkway level will cost between £650 and £850. If you’re in London, prices may be as higher a £1,100. You should remember that if additional levels are required, costs will be even higher. The cost of scaffolding might seem expensive, but it’s an essential part of securing a worksite and providing access to hard-to-reach areas. By understanding the cost factors involved and gathering several quotes, you’ll be able to ensure you’re getting the best price for your project.